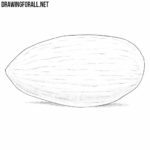 In previous drawing lessons the team of drawingforall.net showed you how to draw a melon and pumpkin. 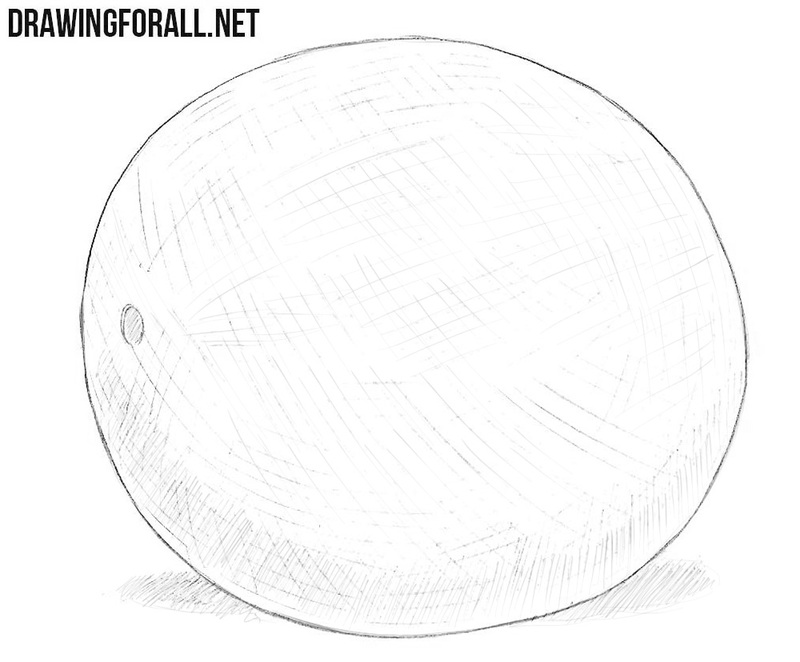 In this drawing tutorial the team of drawingforall.net will show you a similar plant, and as you already understood, the topic of this lesson is how to draw a cantaloupe. 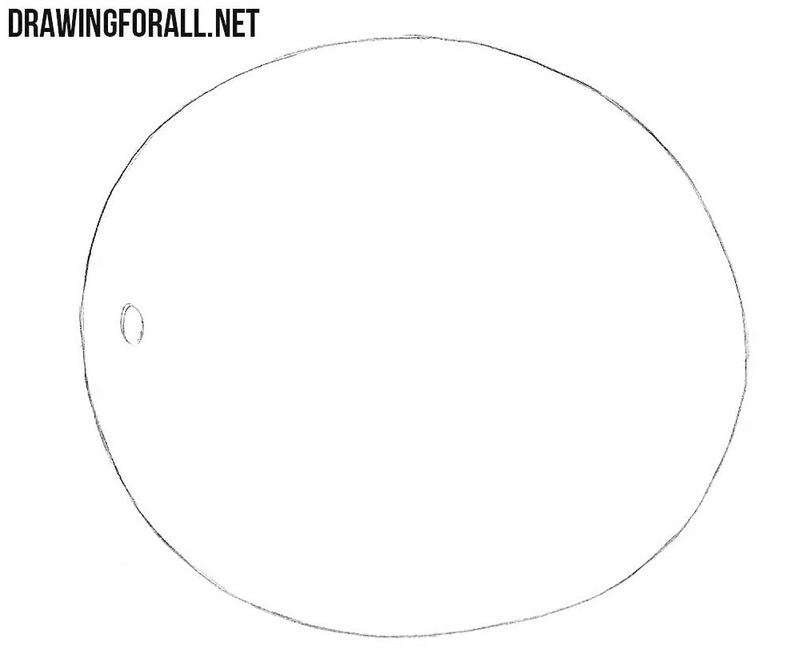 As in the melon lesson, we first sketch out the outlines in the shape of a usual oval. 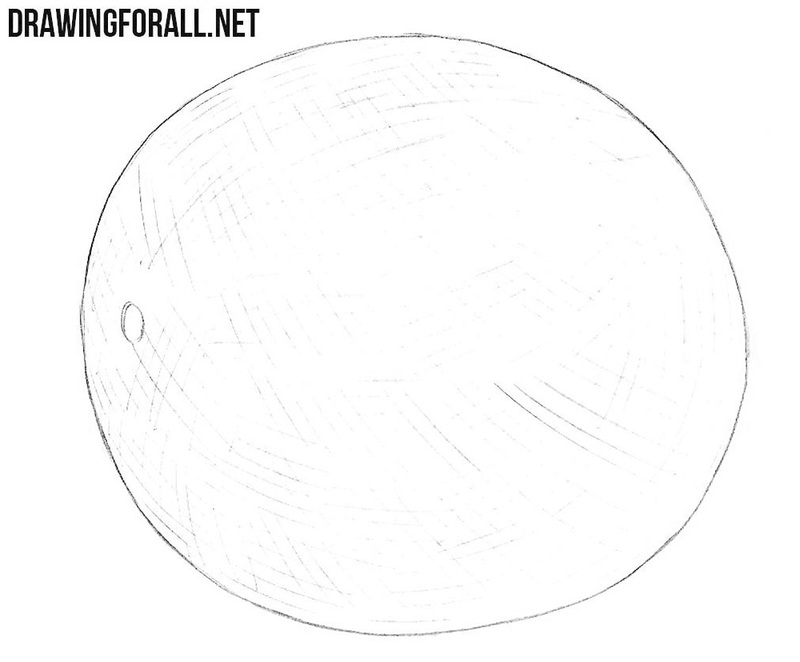 Using a smaller oval sketch the location of the stem. Try to make the most even and clean contour so that in the future we don’t have to correct everything. 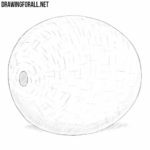 Now with the help of a large number of simple lines arranged in a random order, we will draw the texture of the cantaloupe. All these lines should be very light, almost imperceptible. 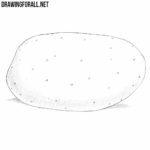 With the help of dense hatching draw the shadows on the bottom of the cantaloupe. Next, draw the cast shadow on the surface under the plant. Perhaps not many people know what cantaloupe is, and today we have tried to show it to you. This lesson consisted of only three very simple steps, and we believe that each of our readers will be able to cope with it. 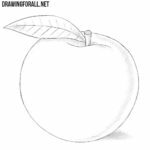 We would also like to note that this lesson is suitable for drawing not only cantaloupes, but also ordinary melons. If you liked this lesson, be sure to go to the category called “Food”, where this lesson is located. 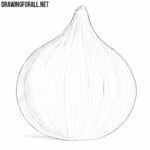 There you will find a lot of lessons where we tell in detail how to draw certain vegetables and fruits. 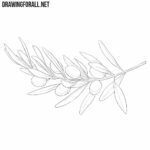 But if you want to try to sketch something that will enhance your skills in drawing on a new level, then try to draw items from our categories about weapons and electronics.